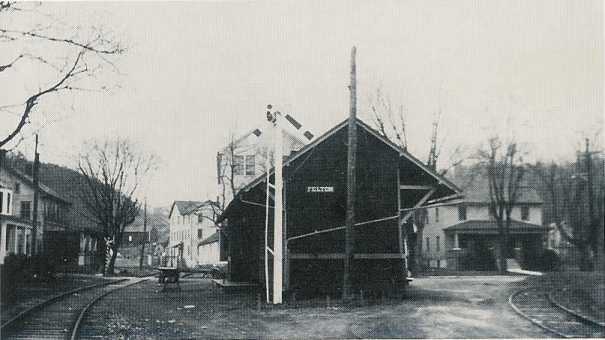 This is a rare photo showing the train order signal high atop the bright white wooden pole by the station's southwest corner, fully intact and operatonal. Far down to the right of the main line in the distance is a near four story structure that once housed the Ralph Jones cigar factory. Photo source: Insurance survey May, 1940. The Pennsylvania Borough of Felton was officially incorporated in 1899. They derived the town's name from a man who later was affiliated with a group of financiers that had taken part in the formation of the York & Peach Bottom Railway Company in March of 1882. In 1900 the population of Felton was listed at 226. Felton's population as of 1990 was 453. Heading south from York, the Peach Bottom Railway's 3'-0" narrow gauge rails reached this area in October of 1874 and a station stop called Felton was immediately established there. During the last six months of 1895, the track was converted to standard gauge, at 4'-8 1/2" between the rails, by the York Southern Railroad, which succeeded the Peach Bottom Railway. Once it became the Maryland and Pennsylvania Railroad, the station at Felton was then listed on the Employee Time Table as station #64. During the late 19th and early 20th centuries, the manufacturing of cigars was a prolific business in Felton. In the late 1970's someone acquired the station and then completely dismantled it piece by piece. This was done with the expectation of fully reassembling the structure on that person's property in another part of Pennsylvania. However, to date (as per the "Ma & Pa Grapevine") any efforts to reassemble the former station structure have been unsuccessful. Fischer, Rudy, Scenes From Ma & Pa Country - Then and Now: Felton Station Area - York County, Pennsylvania; TIMETABLE, Vol 16, Number 4, Fall 2000; The Maryland and Pennsylvania Railroad Historical Society, Inc.
© Copyright The Maryland and Pennsylvania Railroad Historical Society, 2001.